As we ended the year and look back a lot happened and we can only hope that there will be an equal level of activity in 2019. We Now have a submission into VSS just to expand the inventory with some items. We think discovery coins are unlikely in this group of coins. This month we are deep into the die fingerprints as you will see below and to the right. This one has become so complex that it will take another month just to get through the analysis the first time. Hopefully this is an enjoyable read for those who are deep into dies. Several months ago Adobe announced that they were dropping support for our development environment. After a few months of cussing and looking around for an alternative we have settled on one and will begin a transition in February. Right now we maintain five web sites with this one as the largest by far. So it will not be until later this year that we tackle moving the 1881 O web site, but we will get there. In an attempt to put the discussion we started early last year concerning the sequence of die usage for VAMs 20, 1J, 1K, 1H, and 40, we finished an analysis of the corresponding reverse dies. This work is explained below, but a Cliff Notes version is that the analysis drags in VAM 16 because of the reverse similarities. We also brought in VAM 34A because of the reverse die. This is becoming a bit like the movie Groundhog Day where you keep having the same experiences over and over. Hopefully we are close to understanding this sequence and I can move on. But this grouping seems to have a life of its own and I would not rule out visiting it again. The analysis last year only involved the obverse dies and now we are looking at both dies and examining them for each VAM. This book might seem like it has no connection to our work, but if you are a student of history and finance then Chasing Gold by George M. Tabor is an excellent read. I had never stopped to consider how the Nazis financed the war, particularly in the years leading up to the conflict. George Taber has created an excellent and readable account of just how it was done and the role that gold played in the process. For us one surprise was the lack of organization within the German government with regard to finance. He also covers the actions by the Roosevelt administration and how that played out on the world stage. His synopsis of gold confiscation and how the subsequent devaluation of our dollar worked is excellent. We would recommend putting this one on your reading list. Understanding the relationship between nine die pairs is essential to understanding the emission sequence for these nine VAMs. We have added VAM 16 to the discussion because we initially believed the reverse die on VAM 1J could have been a later die state than the reverse die on VAM 16 and that it is but one overpolished die used twice. There are other comments on VAMworld concerning the reverse die for VAM 34A possibly being the same reverse as VAM 40. Then there is VAM 61 and the possibility that the reverse die is a duplicate of VAM 54. We are accumulating enough comments on VAMworld about all of these that they deserve a little more discussion. The discussions seem to focus on just two or three of the VAMs at a time and it is time to look at the whole group. At the least the comments on VAMworld have become a circuitous discussion that cannot be easily followed. This discussion is complex enough and confusing enough that we need to sort the issues out one at a time. Not everyone will agree with our conclusions, but that is the nature of VAMing. VAM 1H and VAM 40, are they the same? After looking at a number of these for quite a while we do believe that these two VAMs are the at the highest level of discussion the same and should be combined with VAM 40 as the survivor. 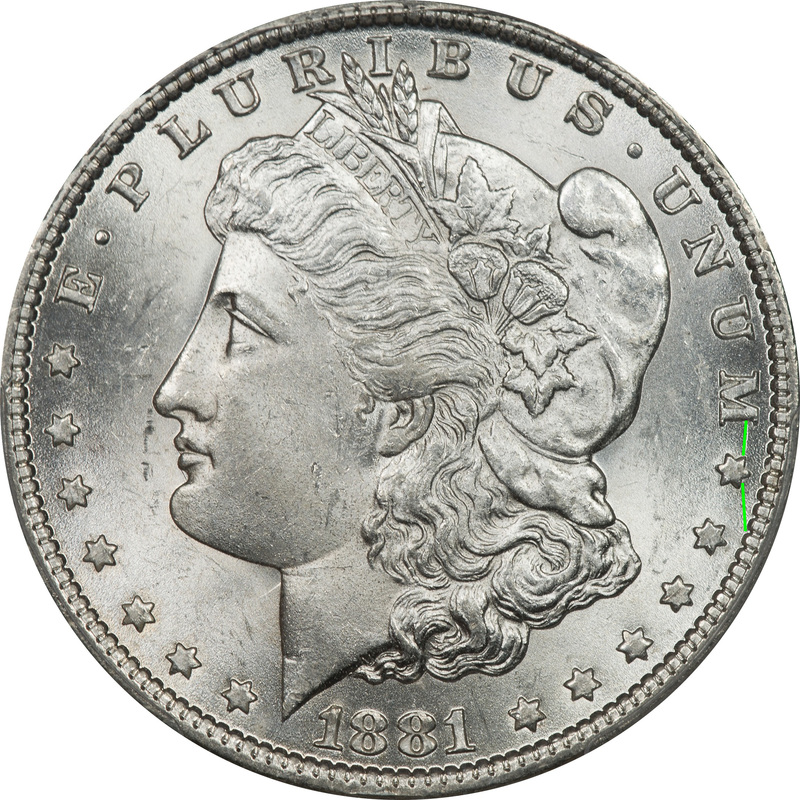 We would also designate the obverse die as 27. The reverse dies are the same, and the description of the surviving VAM needs to include the "Die Gouges Inner Wing" feature. We also think this is worth a designation other than Reverse Die a to distinguish it from others. On the obverse the "Doubled Ear Inside and Bottom" is there but not a prominent feature that just jumps out at you. Are the overpolished reverses of VAMs 1J and 16 the same? The obverses of VAMs 1J and 16 are obviously different, but are the reverses a different die state of the same die? Try as we might we cannot align these reverses. 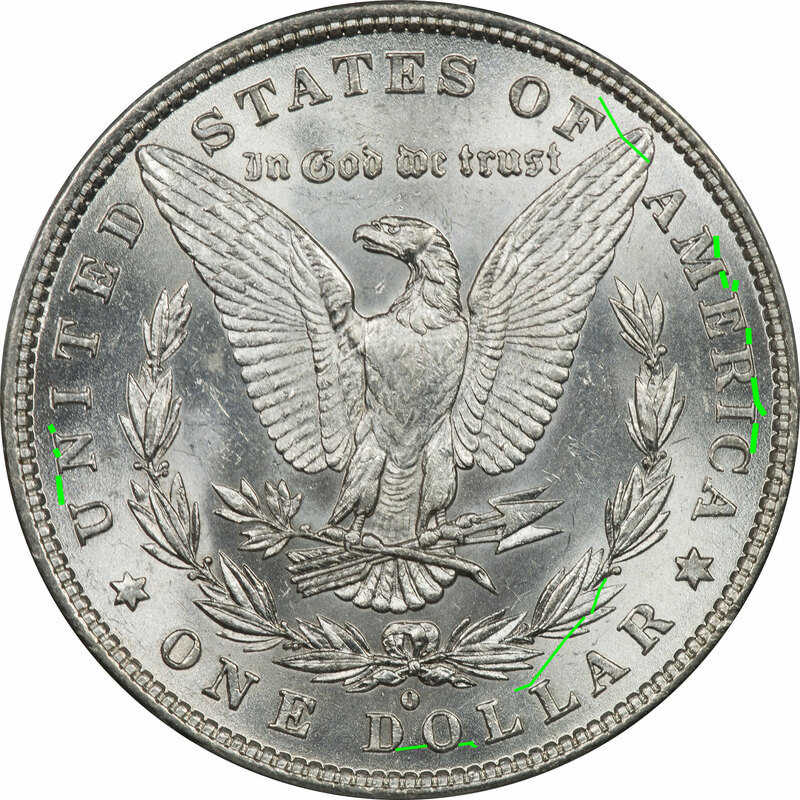 We thought that VAM 16 reverse might have been a later die state of VAM 1J reverse, but the mint marks will not align and we therefore believe they are different. 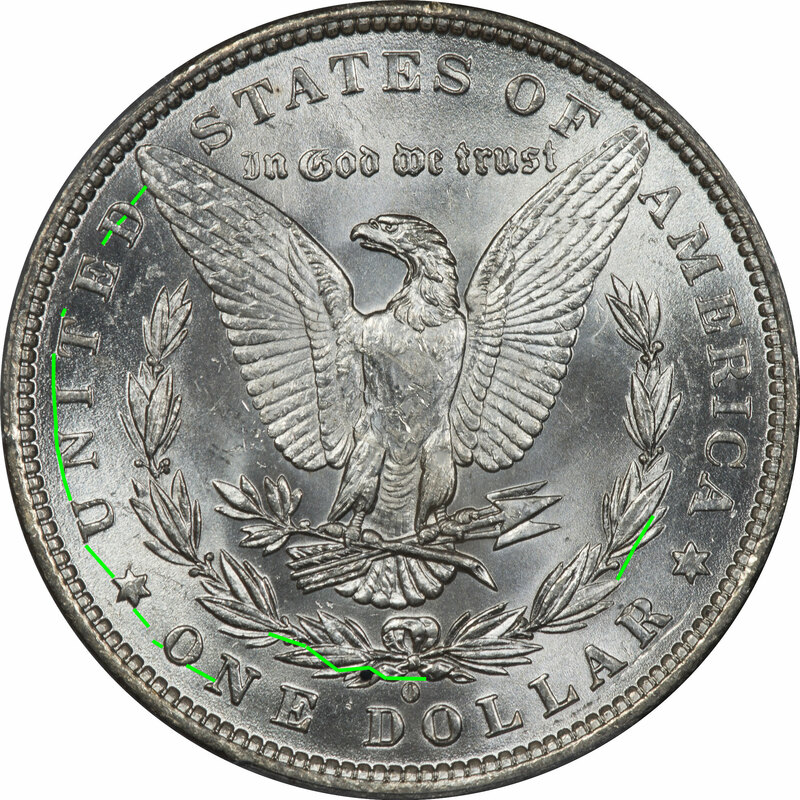 Shown above are the mint marks for VAM 16, VAM 1J, and then the two superimposed. 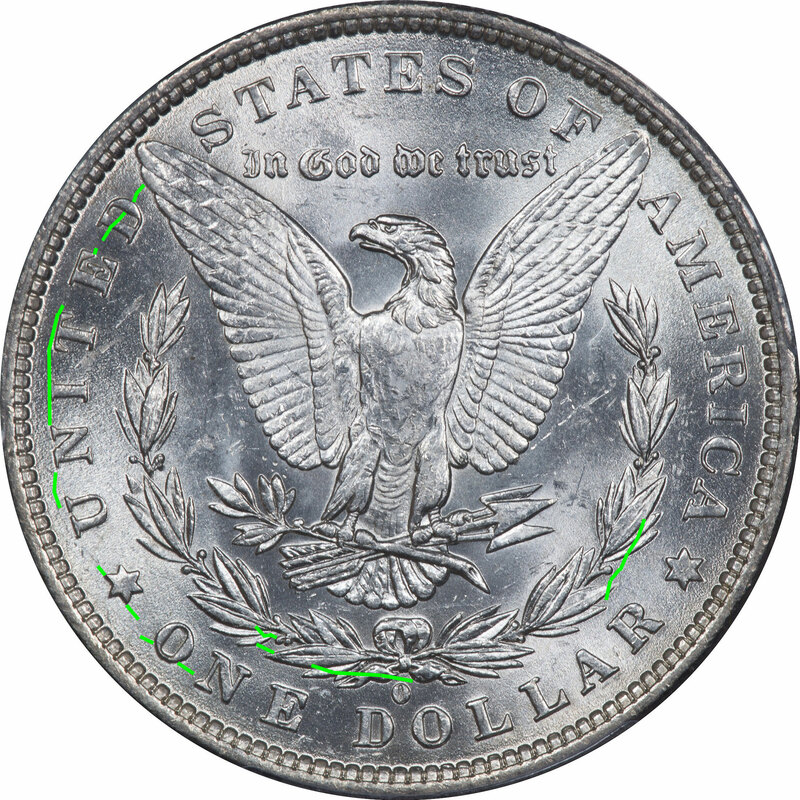 On VAM 1J it appears that the mint mark is slightly lower and therefore closer to the D.
Also, inside the mint mark for VAM 1J there are two diagonal lines that are missing from VAM 16. 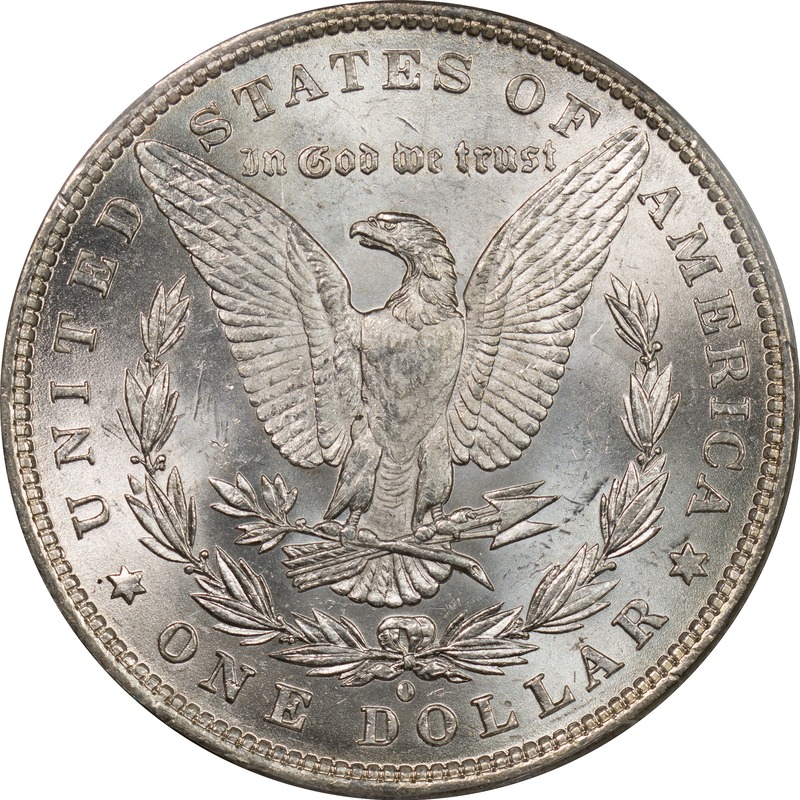 While these could have been polished out, the misalignment of the mint marks makes this unlikely in our opinion. So we are eliminating VAM 16 from further consideration in this emission sequence. Is VAM 24.1 a part of the emission sequence? In the comments on Die 1 of VAM 24 - Doubled Right 1, there is a note that the reverse of this VAM is the clashed version of the reverse die for VAM 1K. We have already included VAM 1K in this discussion so we will add VAM 24.1 for clarity. 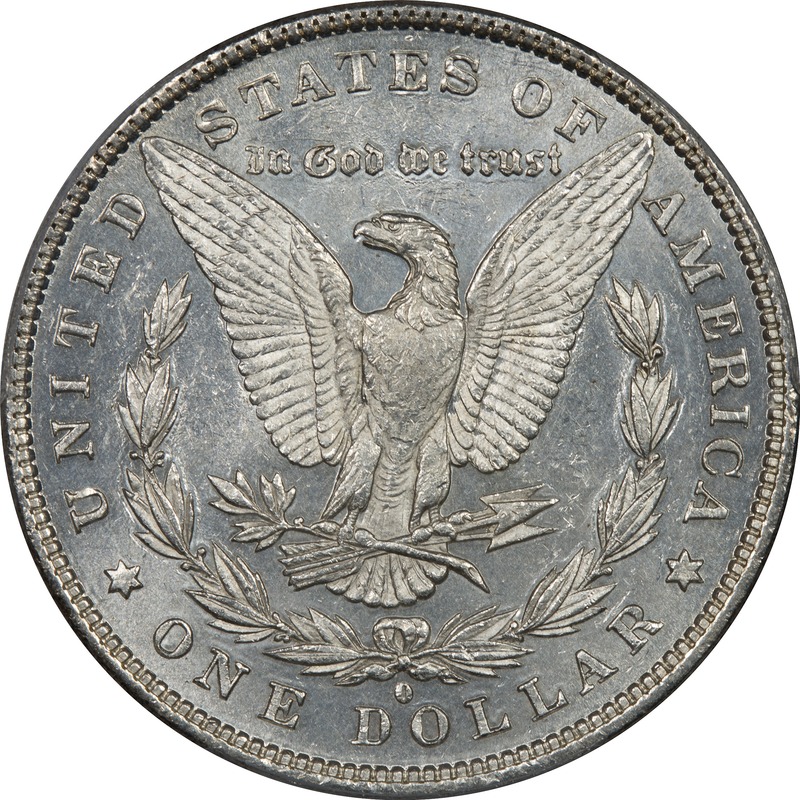 The reverse of VAM 24.1 lacks the die gouges that are seen on several other coins in this analysis (34A, 1H, 1J, 40). But the VAM 1K discovery coin on VAMworld is below MS grade and analysis is difficult at best. We don't believe that we or anyone else has enough evidence to say definitively that VAM 24.1 is in this sequence unless someone can post high quality images of an MS coin on VAMworld. So for now we will leave this as an open issue. Is VAM 61 a part of this emission sequence? 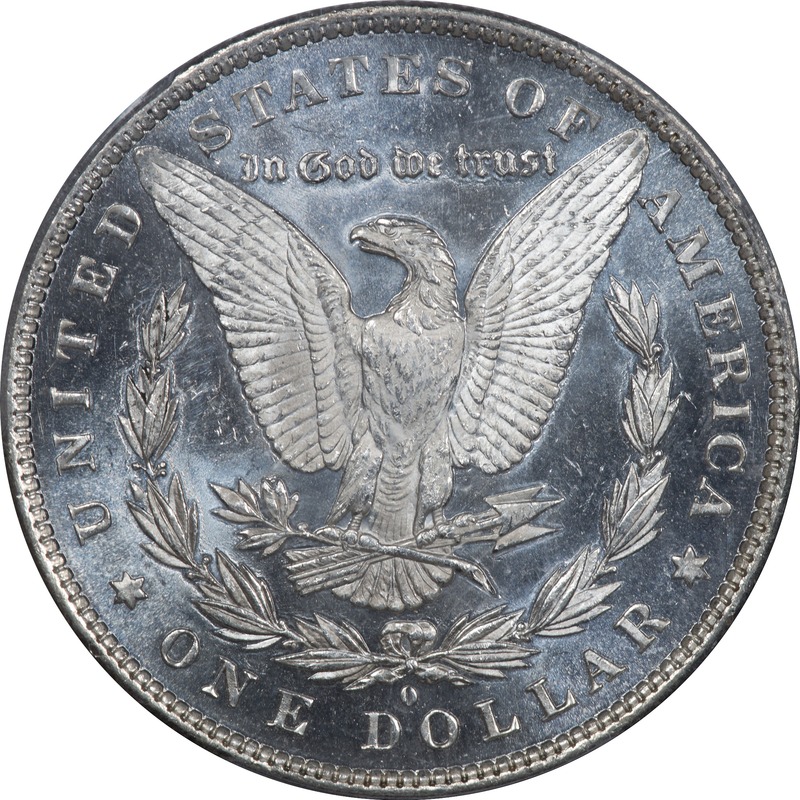 VAM 61 - Doubled 18, O Set Left may prove to be a part of this sequence because it is one of the VAMs designated to use Reverse Die l.
But a brief examination of the obverse of our VAM 61 coins leaves room for doubt. 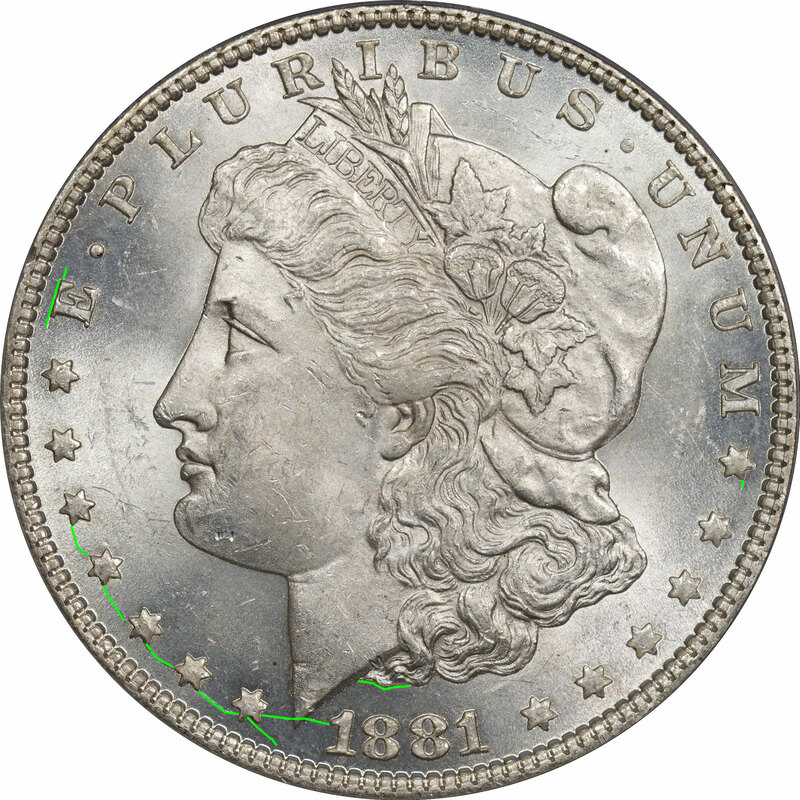 It is clashed on the obverse in a very similar way that looks like VAM 34A. 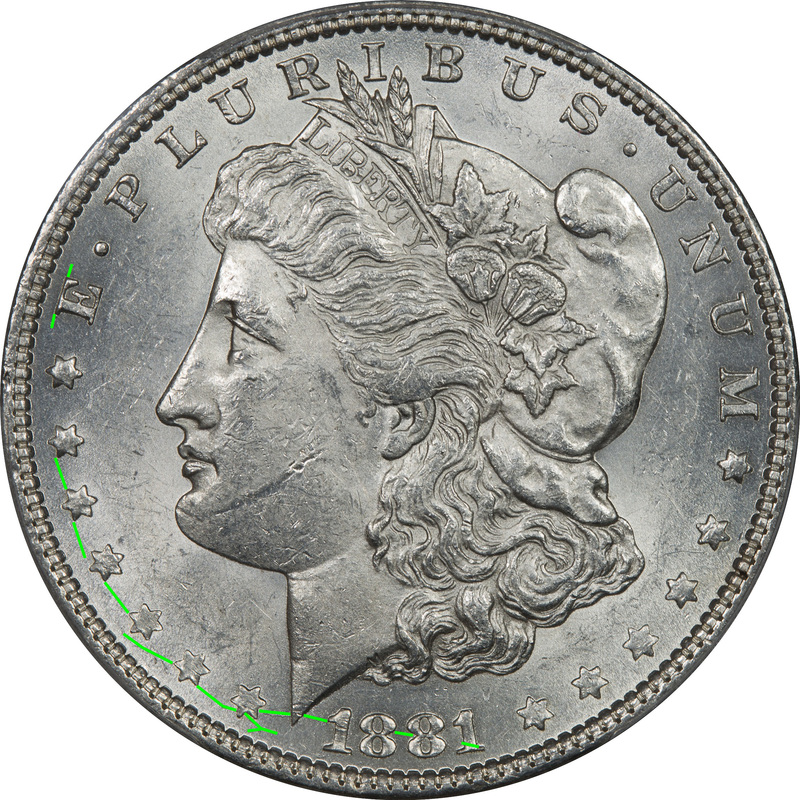 But it appears to be early die state for the obverse and it already has pitting and die cracks. 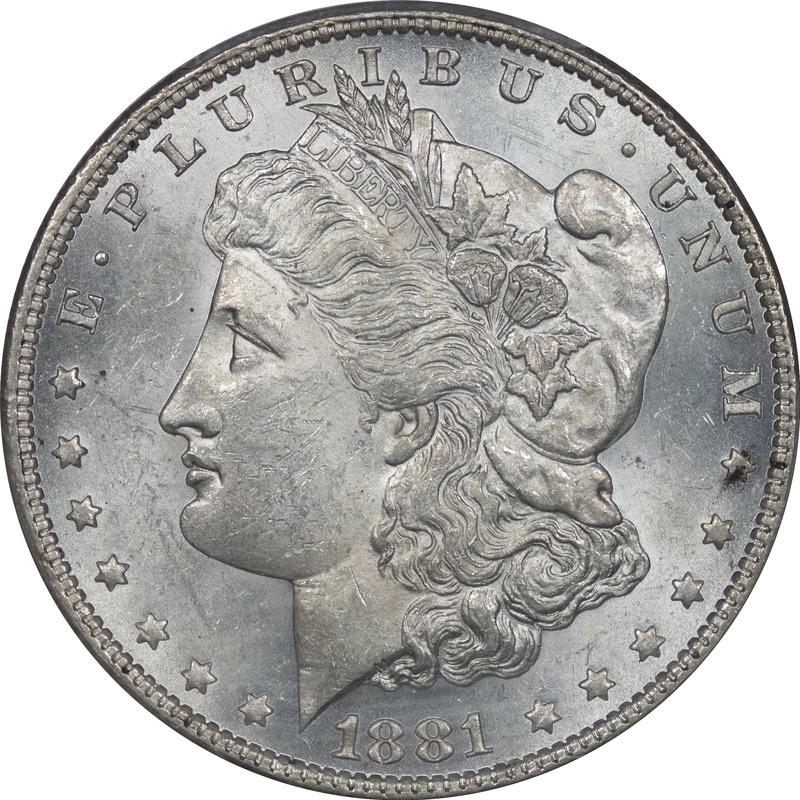 The lack of polishing would point to earlier die states, while the pitting and cracks would place its use as later. The reverse die for VAM 61 has some distinctive die cracks and features. These are lacking on VAM 34A, so more work is in store to sort this part of the story out. If they are the same, just different states, then we cannot yet prove it. There is a note on VAMworld that this is just a different die state of VAM 34A. That may prove to be true, but if there is a connection it is going to take an analysis of all coins designated as Reverse Die l, and there are several of them. Perhaps that is a good analysis for next month, but it will likely be another complex set of issues. Is VAM 34A a part of this sequence such that one or both of the dies are the same as those used in 1H, 1J, 1K, 20, 24.1, and/or 40? VAM 34A does seem to be a part of the emission sequence and does exhibit the same "Pinned Wing" or "Die Gouge in Wing" feature as the reverse die on VAMs 1H and 40. 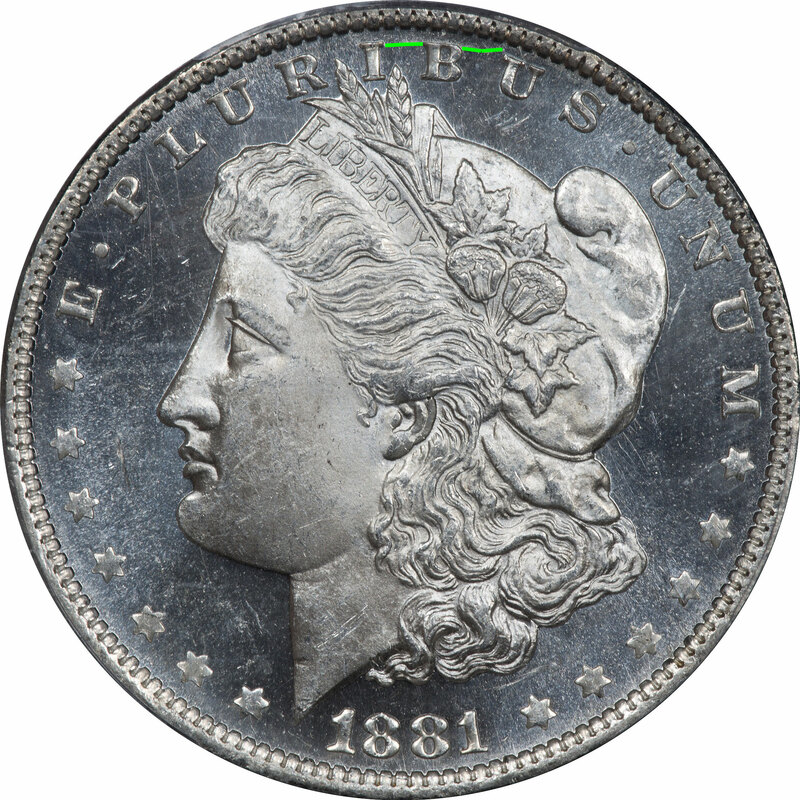 But we examined sixteen VAM 34A coins and found no die cracks on the reverse die, and so it would seem to have come early in production as noted on VAMworld. For sure the gouges described in the wings on VAMs 34A, 1H, and 40 are the same. This is so unique that they can only be from the same die. None of the other VAMs at this point in the discussion have this trait. So we have a grouping at this point of those with the wing gouges and those without. Those with the wing gouges can be divided by the location of the gouges with VAMs 34A, 1H, and 40 in one group, and VAM 1J in the other. The VAM 1J gouges are very different and numerous. Once you see it you know the difference. 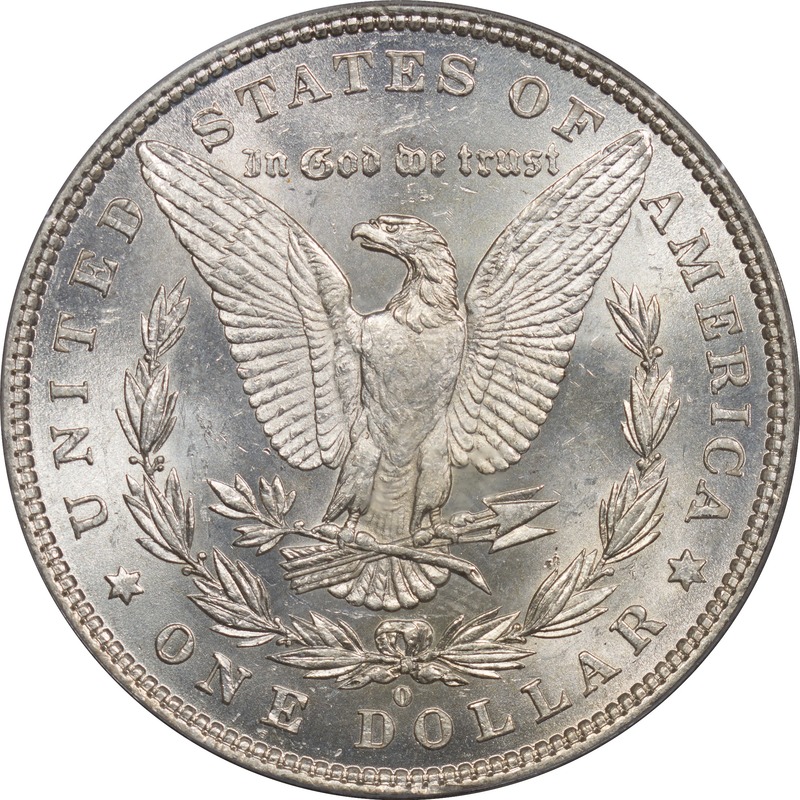 Are the obverse dies used in the creation of VAMs 1H, 1J, 1K, 20, 24.1, 34A, and 40 the same? We have found nothing more definitive to identify different obverse dies for this group of VAMs than the die cracks. Those would indicate that VAMs 1J, 1H, 1K, 20, and 40 are all from a single physical die. The question for us is in the realm of VAMs 34A and 24.1. 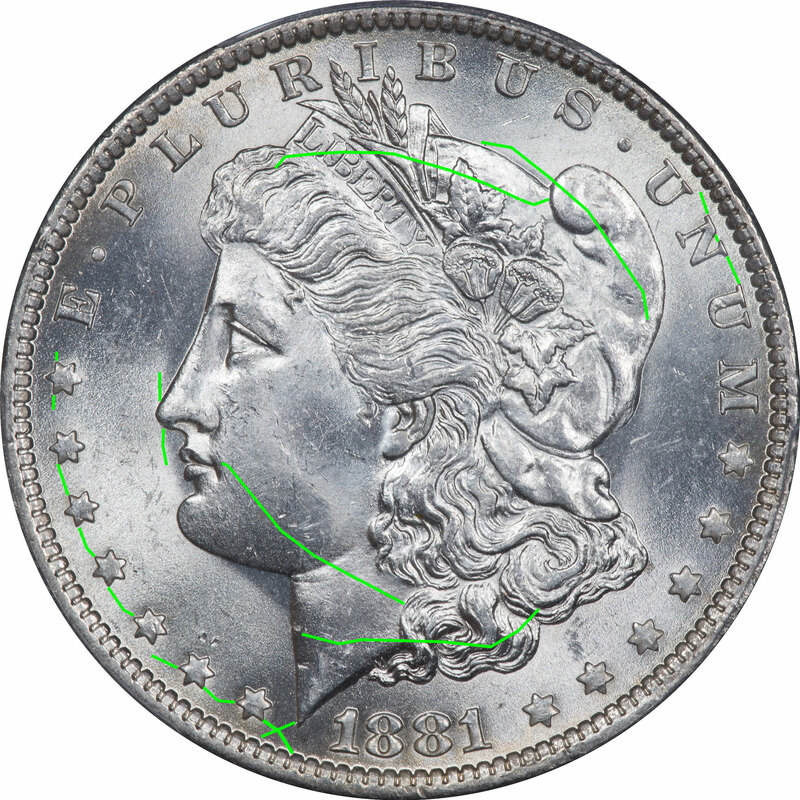 None of our VAM 24.1 or 34A coins show any signs of die cracks so that alignment is not possible. Then we looked at die pitting and on the VAM 1H/40 none of our coins are pitted, so pitting marks cannot be aligned. The VAMs 1H/40 and 24.1 are very lightly pitted, but the pitting will not align with the 34A. The 34A is heavily pitted on all examples and it would seem to us that the pitting is so heavy that this die would have to have come much later in die life. It has been repolished, but not enough to remove the pitting which is in the devices and would have been difficult to correct. In particular on VAM 34A there is some pitting under the eyelid that we think would be very difficult to disguise through repolishing. What was the emission sequence for the VAMs and therefore dies? In April of last year we wrote that we thought that sequence was 20, 1J, 1K, 1H, and then 40. Now that we know that VAMs 1H and 40 are duplicates there would be just four in the sequence. But we know that VAM 34A is also a reverse die participant, so back to five. We do not know that VAM 24.1 is in the sequence at this point because of the lack of photographic evidence that would tie it to VAM 1K. We have not proven the relationship of VAM 61 in the sequence. We also need to weave in an analysis of VAM 54 to complete the story. Next month we plan to extend this work and hopefully draw all of this to some conclusion. We have inventory of all coins being discussed except VAM 1K, but the connection to VAM 24.1 bridges that gap (we hope). For sure this may be one of the more complex emission sequences if we can prove all the connections. Stay tuned please!